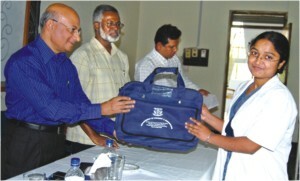 The Faculty of Veterinary Science of the Bangladesh Agricultural University (BAU) organized a Surgical Kit Box distribution ceremony for Veterinary Surgeons at the Gallery of Faculty of Veterinary Science. Vice-Chancellor Professor Dr. M.A. Sattar Mandal was the chief guest. The function was presided over by Dr. Rafiqul Alam, Head, Department of Surgery and Obstetrics and it was attended by Professor Dr. Motahar Hossain Mandal, Dean of the Faculty as special guest. Professor Dr. Md. Monsurul Amin, Professor Dr. M. Golam Shahi Alam, Professor Dr. Mirza . Abul Hashim, Professor Dr. M. Musharraf Uddin Bhuiyan and others spoke on the occasion highlighting problems of Veterinary surgeon's Job in the BCS cadre service. Later, the Vice-Chancellor formally distributed 76 kit boxes among the Veterinary Graduates. The function was attended by a large number of students, faculty members, media workers and high officials of the university administration. English Conversation Club of East West University organized a one-hour workshop on pronunciation on 8 March. The workshop was conducted by Dr. Md. Shahriar Haque, Chairperson of the Department of English at East West University. Students from all departments of the university could attend the workshop. During the workshop, Dr. Shahriar assigned several tasks, including a tongue twister, in which one student was voted out to be the best and was given a reward for it. Sonia Sharmin, Lecturer, Department of English, was the moderator of the workshop. Divsional Informatics Olympiad is being held at Notre Dame College, Dhaka (Shushanta Kumar Sarkar), Premier University, Chittagong (Taufique Sayeed), Rajshahi University (Dr Shamim Ahmad), Khulna University of Engineering and Technology (Professor MMA Hashem), Metropolitan University, Sylhet (Mukammel Wahid) on Friday the 20th of March. Participants are requested to be presented at respective site at 8am. An opening ceremony will be held at 830am and the contest will be held during 9am-12 noon. Analytical and programming skill of the contestants will be tested. The winners will qualifiy for participation in National Informatics Olympiad to be held soon afterwards. Representatives of Bangladesh will be selected in the National Olympiad for aprticipation in International Olympiad in Informatics to be held at Plovdiv, Bulgaria during August 8-15, 2009. Bangladesh Informatics Olympiad Committee, consists of senior academicians of the field and is headed by popular writer and educationist Professor Md Zafar Iqbal, organizes the eventheaded by Professor Md Zafar Iqbal. Bangladeshi students have so far participated in prestigious IOI held in Mexico, Croatia and Egypt. The Daily Star is the media partner. Bangladesh Aacdemy of Sciences and Microsoft have supported the event. 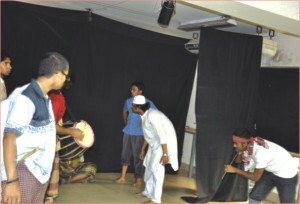 North South University Cine & Drama Club (NSUCDC) performed two dramas on 9 March. The show was held on the university campus at the GMQ café. The newly recruited members of NSUCDC attended a workshop on basic performing system. In this workshop the members were divided into four groups - Music team, Design team, Performing team and Existing team. The members of the existing team performed a large script comedy drama. After finishing the show NSUCDC declared the schedule of another workshop to be conducted by Tareqe Masud. The Science, Engineering and Technology School of Khulna University held the fresher orientation ceremony on March 11, 2009, the first day when the novices of the five disciplines of the School stepped into the campus. The programme began with the national anthem followed by recitation from the holy Qur'an and the holy Gita. The Vice Chancellor Prof. Dr. Saifuddin Shah, the Treasurer Shaikh Abdul Hasib, Dean of the SET School Dr. Akhter Husain Chaudhury and all the five Discipline heads of the School attended the event. After the welcome address by Shehrish Khan, an ex-student of ECE Discipline and now a teacher, the treasurer delivered his speech. Raguil Shakil Rafi, welcomed the fresher students, on behalf of the seniors, while Shakil Mizan expressed his feelings on behalf of the newcomers. Before his speech the Vice Chancellor, as per tradition of the University, conducted the oath taking ceremony of the fresher. In their oath the fresher vowed not to indulge themselves in any kind of political activities in the campus. After the ceremony in the auditorium was over, the students were taken to their respective Disciplines and introduced to the teachers, staffs and the academic facilities where they would pass their next four years. The 6th Grand Convention of ITET (The Institution of Textile engineers and Technologists) was held at the College of Textile Engineering and Technology (CTET) campus in Dhaka on 13 March. The chief guest of the opening ceremony of the convention was Abdul Latif Siddiqui, minister of Textiles and jute ministry. The other guests were the Secretary of Textiles and Jute Ministry, Director General of the Technical Board, General Secretary, President, Principal, faculty members and students of CTET. In their speeches, the speakers demanded the up gradation of CTET to a Textile University, allotment of space for ITET in Dhaka, the involvement of textile engineers in the development program of NITRAD, the declaration of textile sector as a thrust sector and the introduction of cadre service in this sector. Dr. Dipu Mony, Honorable Minister, ministry of foreign affairs was the chief guest at the closing ceremony. 11 Textile technologists were awarded the ITET Award 2009 for there contribution in the field of textile. The event also featured drawing competitions for children, photo exhibitions and a merit competition for children. 1. Please abstain from using both American and British spelling convention in the same article/feature/report. Use either of the two. 2. Send your articles in MS-Word (.doc) file only. Relevant pictures should be sent in JPEG form and never in pdf/tif or any other form. We may not accept pictures inserted in MS-Word files. 3. We have been receiving complaints about misspelled names from Teachers, Professors, Vice-Chancellors and other professionals who attend various events at different educational institutes. Writers/reporters are requested to check the spelling of names before mentioning those in their articles. The best way is to ask for a visiting card of the person being mentioned. On receiving further complaints, we may have to stop publishing any more articles/reports from that particular author. Star Campus will not be held responsible for any wrong spelling of names. 4. Star Campus is open to articles and features from all teachers and students from different universities, schools (Grade 9 and 10 only) and colleges in Bangladesh, as well as from Bangladeshi students and teachers studying/teaching abroad. It is a common misconception that we have a set group of writers, which actually is not the case. 5. Because of the overwhelming popularity of Star Campus, we receive hundreds of articles, features, photo features and travelogues. So do not be disappointed if your article does not get published soon after you send it. A good article will surely get published, sooner or later. 6. We encourage articles about events in your institute or thought-provoking articles based on real life scenarios. Because of space constraint, we cannot always entertain poems and short stories sent in by our contributors. 7. For the first time writers, our suggestion is to have your write-up checked by a teacher before sending them to us. We find many articles being sent to us without properly being checked beforehand. Common errors include the usage of small letters for people/organization's names, using '&' in place of 'and' among other things.